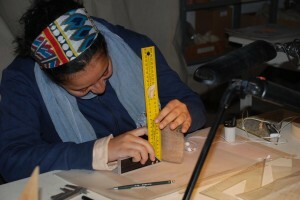 From working at several archaeological sites in Egyptian Delta and Nile valley up to the First Nile cataract and acquaintance with various types of ceramics, it can be said that the pottery collection coming from SAV1 North in Sai Island offers a significant opportunity to study a great diversity of both Egyptian and Nubian pottery. These are diverse in fabrics, manufacture techniques and shapes. Such a variety is evidence of a multi-cultural society that has lived on Sai around ca. 1400 BC. During the first ten days of the 2013 mission, pottery drawings achieved have covered a good amount of these various ceramics mainly including the essential elements of house hold such as storage vessels, dishes, bowls and cooking pots. The Nubian ceramics, containing a good majority of cooking pots decorated with impressions from rectangular or circular basketry, recall the Nubian pottery found on Elephantine Island during the early New Kingdom in shapes, decorations and handmade techniques. Other vessels like dishes, flower pots and incense burner are typical of Egyptian 18th Dynasty style. Drawing both Nubian and Egyptian pottery simultaneously allows a worthy chance of comparison. The pursuit of ceramics documentation throughout this season can indeed expose other interesting details that are crucial to the study of the whole pottery corpus in Sai.